Angela C. Evans is an attorney and native of Lexington. Prior to her election in 2015, Councilmember Evans served as an Assistant Attorney General of Kentucky for six years, providing legal services to various state agencies. She also previously served as General Counsel to the Kentucky Secretary of State. 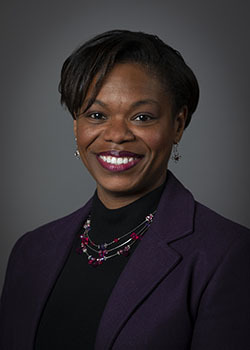 Councilmember Evans began her legal career as a Public Defender in Lexington, Kentucky, representing indigent clients in misdemeanor and felony court. She also served on the Ethics Commission from 2002 to 2009 and served as Chairperson from 2007 to 2009. Councilmember Evans is received her Bachelor’s Degree in Social Work with honors, from Clark Atlanta. She is a proud graduate of the University of Tennessee, College of Law, where she received her Juris Doctorate in 2000 and was awarded the Dean’s Citation for exemplary service to the College of Law. The sixth district is a wonderful place to live, work and play! This diverse district is home to 17 neighborhood associations, nine public schools, and seven city parks, including the Brighton Rail Trail, a shared use trail from Man O War Blvd, connecting to Pleasant Ridge Park and Polo Club Boulevard. Also, the bustling Hamburg Pavilion draws thousands of citizens from across Lexington and neighboring counties for business and pleasure. The sixth District also has a rich cultural history. Notable historic sites include the horseshoe shaped Hamburg Place Horse Cemetery, one of Hamburg’s loveliest green spaces which house the remains of some of racing’s most famous thoroughbreds and several Kentucky Derby winners. Cadentown School, a segregated county school located on Liberty Road, at Todds Road was established in 1873 and closed after the Second World War. It later served as a settlement for freed slaves after the Civil War. Additionally, the namesake of the Bryan Station neighborhood and schools, Bryan’s Station was a frontier fort that came under a combined Native American, Tory and Canadian Ranger attack in 1782. The major corridors in the 6th District are Paris Pike, Winchester, Liberty and Bryan Station roads.